Oculus Rift hasn't gone on sale yet, but Facebook CEO Mark Zuckerberg is already imagining what future iterations of the virtual reality headset could look like. During a Facebook town hall, Zuckerberg theorized the Rift will lose its visor-like appearance and eventually resemble a pair of glasses. 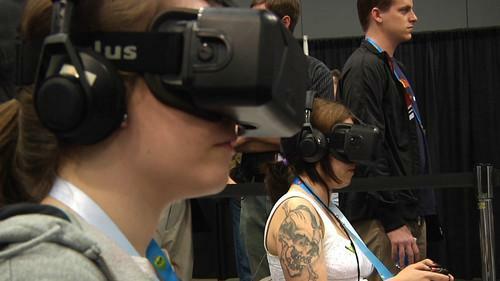 Facebook purchased Oculus, the company developing Rift, for $US2 billion last year. Eventually, the headset won't need to be tethered to a computer to work, so people can move around freely while wearing it, Zuckerberg said. Instead of pulling out a smartphone to share pictures with friends, people will use their virtual reality glasses to open photo albums, resize images and view them through the headsets, he said. Don't expect to see these capabilities when the consumer version of Oculus Rift becomes available in the first quarter of 2016. Zuckerberg predicted that it will take between five and 12 years before this technology works reliably and the headset becomes affordable for people. A timeline of a decade or longer before virtual reality becomes mainstream didn't keep Facebook from pursuing Oculus. It purchased the company knowing "there's a ton of work ahead" but with the understanding that virtual reality is the next computing platform, Zuckerberg said. Oculus was keen on Facebook buying it since the social media company has the capital to invest in developing a virtual reality platform, he added. Part of that work involves rewriting apps for virtual reality environments where people don't use a screen to interact with a computer, Zuckerberg said.